I see you've opted out of our labyrinth of puzzles that serve as the Christmas Letter for 2017. No problem, we still love you anyway! We VanderVoords have been busy this year, please enjoy a little glimpse into our activities. Abby and Ethan are both in 8th grade this year. Abby is finishing her second year at Immaculate Heart of Mary (go Vikings! ), where she wears a red, white and blue uniform to school each day. She is in a class of 25 8th graders, which suits her just fine. She’s made some great friends there, and loves her teachers. It has been a true blessing. Abby loves her English and Literature classes and doesn’t much enjoy math. Ethan is finishing his last year at Pinewood Middle School. Pinewood has as many students in 6th to 8th grades as IHM has from Kindergarten to 8th, which suits Ethan just fine as it provides lots of opportunity to make new friends. Ethan loves social studies and dislikes English, and is in his third year of band playing trumpet. Trista finds herself in school a few times a week as well, volunteering for the 4th year in her niece Courtney’s 1st grade class at Bowen Elementary School. This year, Trista is reading with four students three times a week. All of the kids are English Language Learners (students who are relatively new to the English language). ELL students are learning vocabulary, sentence structure and so much more in addition to learning to read, so additional support can help a great deal. It is really rewarding to see those kiddos develop reading skills. Mark is always learning new things, although not in a traditional classroom. Sometimes he takes classes on Udemy (which also hosts the class he teaches) and sometimes it's self direction. This years he's worked with a new computer language as well as improving his skills in security and encryption (both modern and otherwise). Mark entered into his 3rd year on Pastoral Council at St. Mary Magdalen. Our priest of 8 years, Father Godfrey, was moved to another parish over the summer, and we now welcome our new pastor, Father Peter. Mark enjoys getting a behind-the-scenes look at the activities of our church, and getting to know some of the other members of our parish better through this ministry. Abby celebrated the Sacrament of Confirmation this autumn with her 8th grade class at Immaculate Heart of Mary. She and her sponsor Aunt Becky (who is also her Godmother) prepared for the Sacrament by reflecting, praying and service. 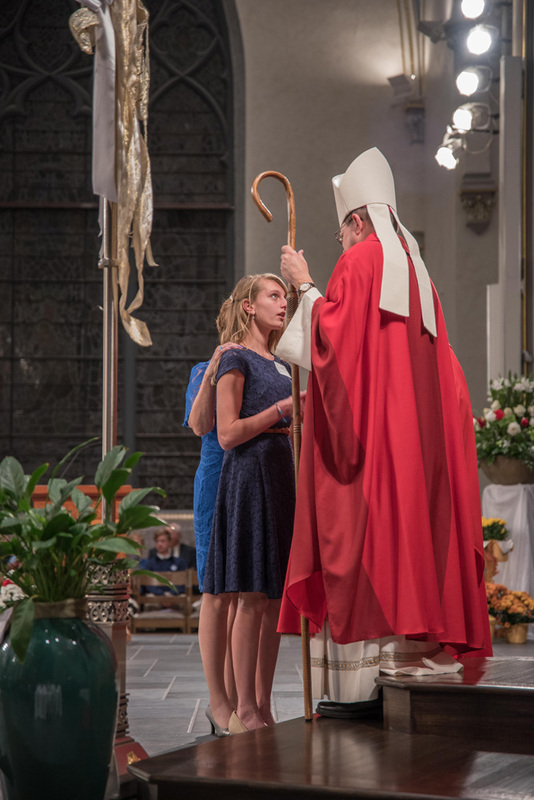 It was a beautiful night at the Cathedral when Abby received the gifts of the Holy Spirit. Some activities that we are involved with take a lot of attention, but are very important to us. In the analogy of the rocks/pebbles/sand filling our time, these activities are the big rocks – the things worth spending time on to make us better. Mark set a goal for himself last winter, to run the 25K at the River Bank Run in Grand Rapids. He spent months training over the winter, with a personal trainer at the gym to work on strengthening his core, and running miles and miles on a treadmill (or outside once the weather got nicer). He got himself in shape, and accomplished his goal. It is the longest race Mark has run, and we are very proud of him! Ethan is very involved in Boy Scouts. He found a renewed interest last spring, and was elected into Order of the Arrow (the National Honor Society of Boy Scouts). Our Arrowman also ran for Patrol Leader in his troop and was elected for that as well. He is now Star Rank (very close to earning his Life Rank). He also holds a leadership position as Den Chief for one of our local Cub Scout Packs (helping to lead the younger scouts in their meetings). Trista is also still involved in the operation of the troop as the Troop Committee Chairperson. Abby and her cousin Lana took a photography class for teens this summer. She really enjoyed the new art form, and we hope to see much more beautiful art coming from her. Ethan completed his second year on the Middle School Water Polo Team. He loves it even more than competitive swimming. He scored and assisted quite a few goals this past spring, and we are excited to see how he does as an 8th grader. The matches are very exciting! Our year has been very busy with robotics. Ethan has been involved in middle school robotics since 6th grade, and volunteered Mark to be a Mentor the very first week. 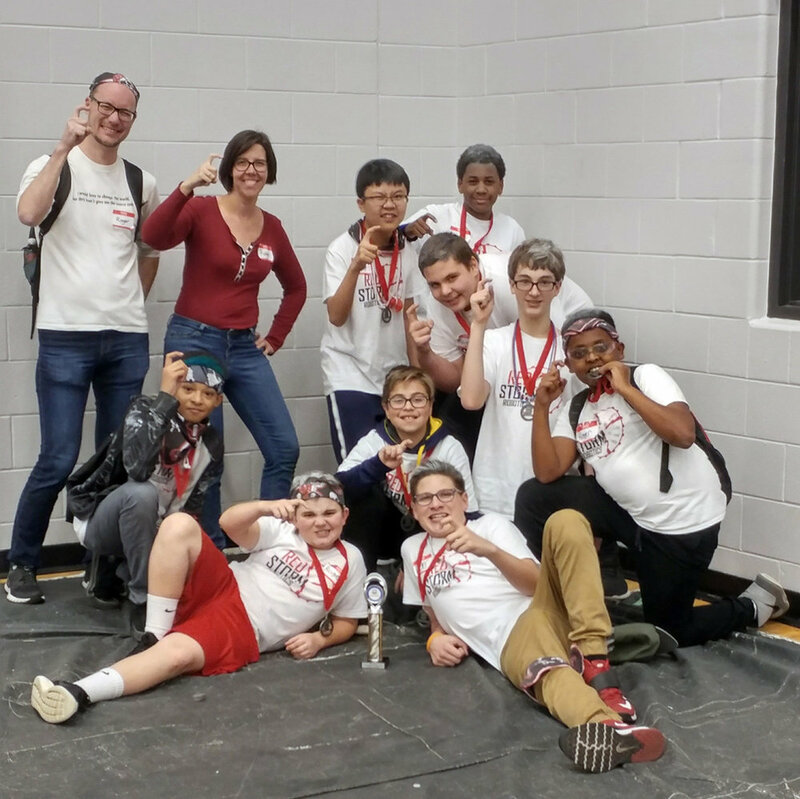 Mark has mentored Ethan’s team each year, and last spring found out that although the team hadn’t been competitive enough to make it to the State competition, they were chosen in a random lottery to attend the World competition (in order to fill the spot of a team who couldn’t make it). So in a matter of two weeks, the team built a robot (theirs had been disassembled by then) and headed to St. Louis for a 5 day event. It was amazing! The team wasn’t very competitive, but the experience was well worth the trip. This fall, Abby joined robotics as well, but on a sister team to Ethan and Mark’s team. And to round it out, Trista started “sous mentoring” with Mark. During the regular season, the sister teams did very well, winning awards at both competitions they attended as well as both qualifying to compete in the State competition later in December. We only have to make a trip to Battle Creek for that one, thankfully. Wish us luck! Ethan tried to wear contacts. After many (many) frustrating attempts, we determined that he wasn’t quite able to get them in on his own and the glasses returned. We were blessed to take so many fun vacations this year! See this video for the highlights. We are grateful for another blessed year, full of fun, family and friends. Wishing you a very Merry Christmas and Happy New Year!